The most celebrated festival in India, Diwali celebrates Lord Rama's homecoming after defeating Ravana. It symbolises the victory of light over darkness, which is why one of the common practices is to light oil lamps and neon lights, exchange sweets and burst crackers. The celebrations start with Dhanteras, followed by Naraka Chaturdasi on second day, Deepavali on the third day, Diwali Padva dedicated to wife–husband relationship on the fourth day, and it all ends with Bhai-beej dedicated to sister–brother bond on the fifth day. As times changed, so did people's approach to the festivities. Diwali in the 90s was simple; people lit small clay diyas, made a colourful rangoli, bought fire-crackers in bulk, packed tons of gifts for friends and family, played cards and made merry. In recent times, it is more about packing your bags and taking your nuclear family to a small getaway to vacation spots. Decorating the house is always a major task. It normally means lots of lights, colourful rangolis and torans. 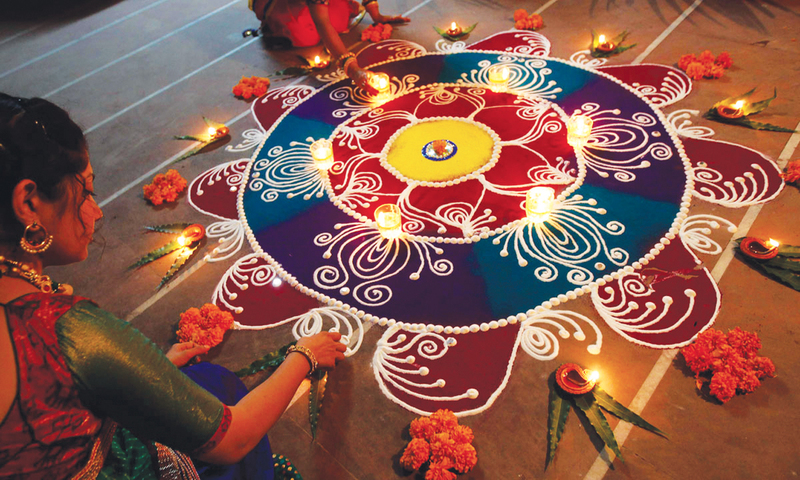 The most common decoration everyone resorts to is making colourful rangolis, drawing it on the courtyard, and the floor. Celebrated over five days, the last and the best designs are always saved for Diwali day which also includes flower decorations. The modern life has resorted to sophisticated arts of decoration. Fairy lights and candles have replaced diyas and, rangolis have found a substitute in colourful synthetic sheets. However, what is not lost in transition, is the spirit and the cultural significance of the festival. As beautiful as they are, they are extravagant purchases and people usually end up splurging more than they intended. 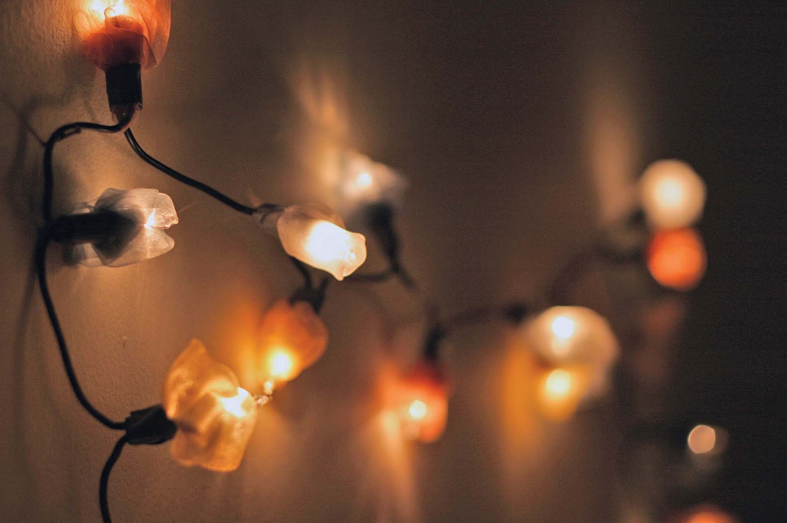 If you aren't keen to invest in Diwali doodah, here are a few DIY decoration tips. Read and learn, people. Everybody puts up strings of LED lights to make their house extra snazzy. An extra step and your humble abode will surely stand apart. A set of plain LED fairy lights. (Definitely LED, normal bulbs get too hot and may catch fire). Choose colours for your rosebuds, brighter colours work best. Carefully bunch a piece of fabric around the plastic base of the bulb. Experiment with different methods of wrapping and folding until you get a rough flower shape. Tape the ends of the bud on to the plastic base (not the bulb) to secure your rosebud. Repeat until you have covered all of the little bulbs. Not every bud needs to be the same. 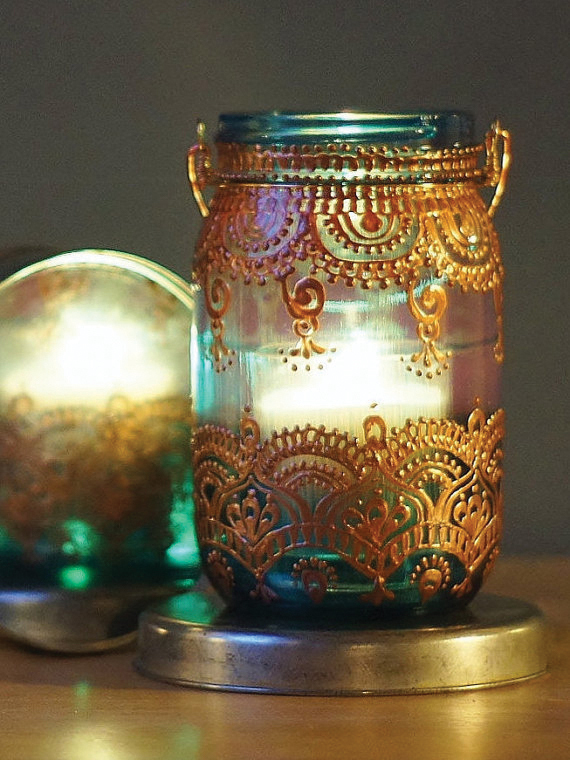 Lanterns are synonymous to Diwali and also the perfect way to add an ethnic touch. Found empty glass jars during your annual house cleaning? Don't throw them away! Our DIY experts know just the right way to recycle them. Remove labels and any glue residue from the glass jars and dry completely. Apply the gold dimensional paint in various patterns. Draw different decorative patterns or push around the paint to create solid areas of gold. Let dry. Pour a small amount of glass paint inside the jar and use your paintbrush to coat all of the jar’s interior. Let dry. Your lanterns are now ready. Put some candles inside and add loops of wire to the tops to hang. 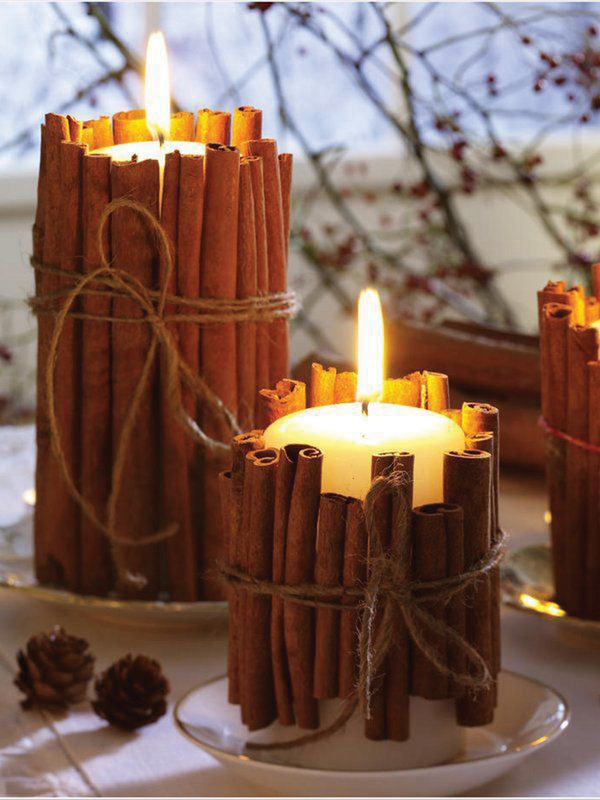 Why use the same old, bland candles when you can spice things up a bit? Place an elastic band around the bottom of the candle. Slide it up a couple inches and make sure it lays flat with no twists. Carefully slide in the cinnamon sticks behind the elastic band, one at a time. Wind your twine around the the candle 5-6 times to cover the elastic band. Once you have covered the elastic, tie off the ends of the twine in a double knot. Then tuck the knot under the other strands of twine to hide it. Simply wrap the ribbon around the candle and over the twine to tie into a bow. This is the simplest and the most original idea ever. Do not be fooled and, see your drawing room get an instant uplifting with this theme. Fill the bowl with water and stick some small candles or flowers in it. Place it on the centre table of your main room. Use your bangles in more ways than one. Make adorable trinkets and hang it on the wall for extra oomph on your plain walls or doors. Loop pretty satin ribbon through the small knot you just made. Tie a bow at the top of your satin ribbon and hang! Paint them with a base coat of any colour. Allow to dry. Decorate them with stones or hand paint them with different coloured paints. Apply varnish and leave to dry.